Multiple Notch receptors and ligands are expressed in the developing cardiac outflow tract. In situ hybridization analysis of cross-sections through the outflow tract and aortic arch arteries of E12.5 embryos is shown. 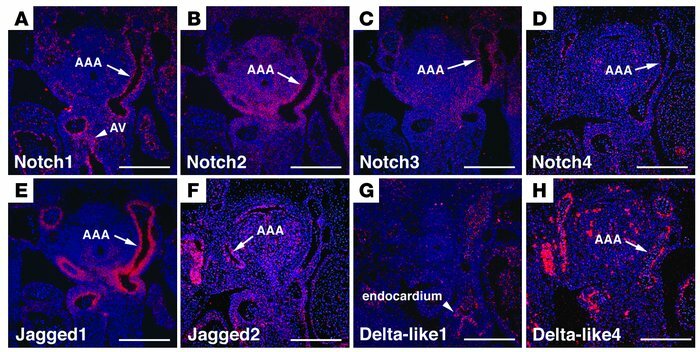 (A) Notch1 is expressed by endothelial cells lining the aortic arch arteries (AAA) and by endocardial cushion tissue of the developing aortic valve (AV). (B) Notch2 is expressed broadly throughout the pharyngeal mesenchyme and notably by the neural crest–derived cells surrounding the aortic arch arteries. (C) Notch3 is expressed by neural crest–derived cells surrounding the aortic arch arteries. (D) Notch4 is expressed by endothelial cells of the aortic arch arteries. (E) Jagged1 is expressed by neural crest–derived cells surrounding the aortic arch arteries. (F) Jagged2 is expressed broadly in the pharyngeal region, including cells surrounding the aortic arch arteries. (G) Delta-like1 is expressed by endocardium but is absent from the aortic arch arteries. (H) Delta-like4 is expressed by endothelium of the aortic arch arteries. Scale bars: 100 μm.